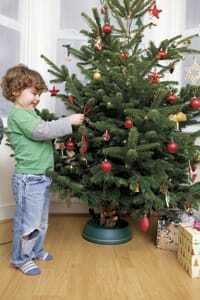 Forget the in-laws – the house guest most of us wouldn’t be without over the holiday period is a Christmas tree. Your festive fir needs to be secure and easy to water, and a Christmas tree stand is the best piece of kit for the job. Which? has put ten Christmas tree stands to the test. UPDATE: We haven’t tested Christmas tree stands in 2012 but you can still see the results of our 2011 test – most stands are still widely available. If you’ve opted for a ‘cut’ tree – one that has been cut off at ground level and so doesn’t have any roots – you’ll need to treat it like a giant cut flower and keep it well watered. This will ensure that it looks good throughout the festive season and will be less likely to lose its needles. The simplest way is to put it in a Christmas tree stand that holds plenty of water and keeps the tree upright. Which? has tested ten Christmas tree stands priced from £14.99 to £35.99, and has found two Best Buys. All of the stands we tested had adjustable clamps to keep the tree in place and a water reservoir. Mounting the trees securely upright proved much more of a battle with some rather than others, and some had small water reservoirs which meant they needed topping up more often. On some models it was hard to check the water levels.